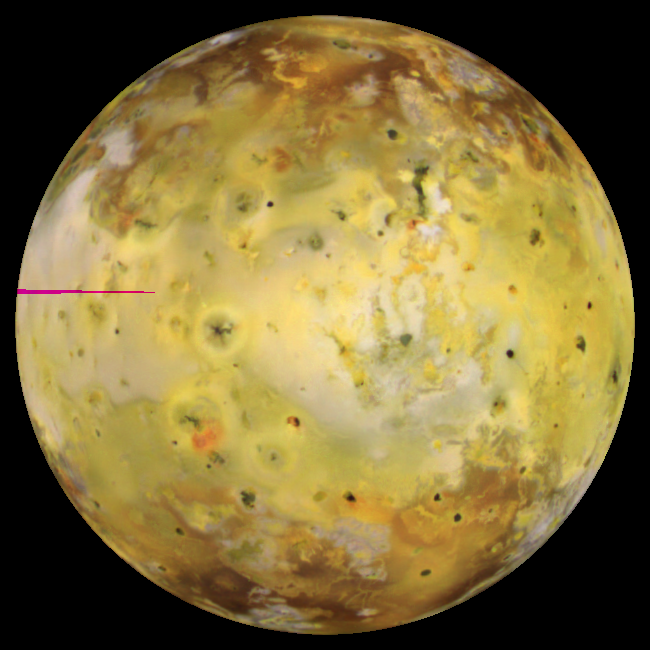 Last year, I started a little project to create color maps of Io for each Galileo orbit there was color data. The intention was to make it was easier to illustrate surface changes by combining these maps into a single Photoshop file. Last January and February, I managed to get through G1, G2, C3, C9, G29, and I31. Over the last two evenings, I've gone ahead and added two more orbits to the list: E4 and E6. These two orbits from the middle of Galileo's primary mission occurred in December 1996 and February 1997, respectively. The E6 map is particularly useful as it is one of the few orbits for which a nearly global map was acquired, though one of the observations, E6ISRA____01 had many of its color frames cut off. In addition to finishing these two maps, I also have two new reprocessed versions of a couple of observations: E4ISGLOCOL02 (shown above) and E6ISRA____01. 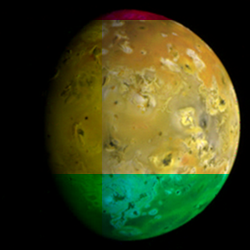 While these both are processed to provide a view of Io in color that is not overly saturated, the E4 observation uses a near-infrared filter centered at 756 nm for red and a violet filter for blue, so the color isn't exactly what you would see with your naked eyes, but it is the closest you are going to get with this data set. I hope these maps are at least interesting to some of you. Tomorrow evening, I will see about whipping up ones for G7 and I32.